Nurul Ali. 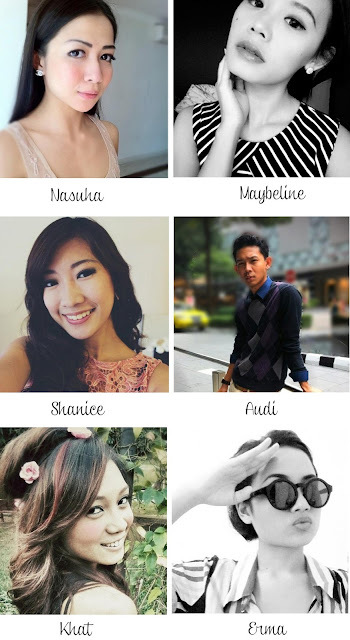 | Singapore Fashion & Lifestyle Blog: Models, Outfits, Music - CHECKED! Models, Outfits, Music - CHECKED! Just two days away from the Bugis+ Fashion Showcase and I'm freaking outttt! This is definitely not my first time going on stage, but you know... the nervous feeling will always be there. On a brighter note, my models are finalized! So does their outfits! And the music! Initially, I thought I would have trouble scouting for models cause well... they will not get paid for this event? But no! I actually have people willingly volunteered to be my model! Audi and Shanice were one of the few who actually volunteered. Thanks both! Here's a sneak peek of my models who will be involved for the show this Saturday! All so chio (and handsome) right? I'm so blessed and proud of myself that I manage to scout all these beautiful people within a short period of 2 days! I deserve a pat on the back. Out of 6, only 2 are friends I met in school. Others, they are either friends I've made during some events, on facebook, etc. So you see, networking actually plays apart. Now I understand the importance of networking. I can't believe 7 days have passed just like that. I remember having a briefing with the other 3 bloggers at the Bugis+ Management office last Thursday. I remember whining at my boyfriend that I did not have sufficient time to source for the models' outfit. - My boyfriend being hopeless as usual, asked me why I participate in the competition when I clearly know my schedules are tight. Not helpful at all. Pfft. - I remember having difficulties to search for runway music that could go with my theme. I remember spending the night choreographing the walk in my mind. I remember, I remember, I remember... So much things to remember! Till then, I need my sleep now. Will talk to you about the preparations on my next entry! Muahhhh!